Hello, my name is Deborah and I am a thrill ride junkie. I LOVE the feeling of losing my stomach on a roller coaster’s first major drop, as well as the speed and out-of-control careening along the tracks. But I always know that these rides are actually controlled and monitored. 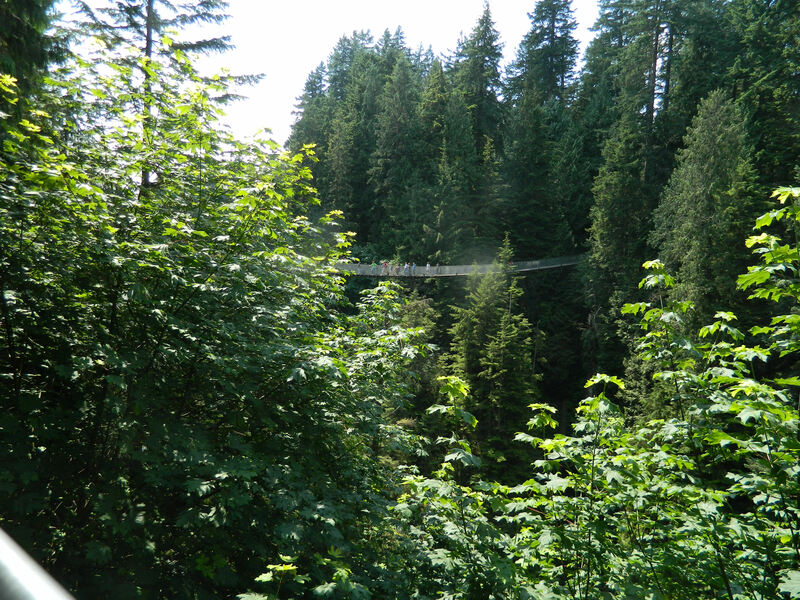 That knowledge flew right out of my head the first time I began to walk along a very high wooden bridge just outside downtown Vancouver, British Columbia. As it started swinging, I became convinced that it was going to dump me right into the gorge below! 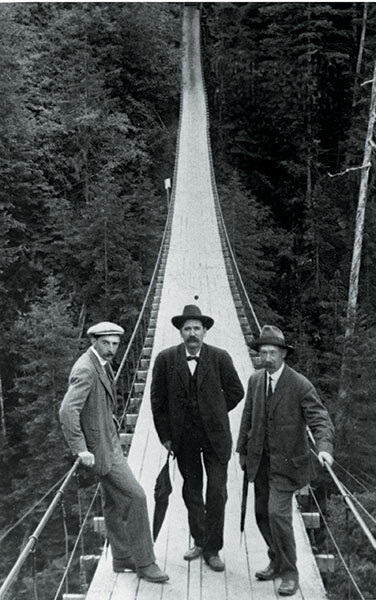 I had read a little about this Canadian bridge beforehand, including that it was built back in 1889 and has been open to huge groups of brave tourists ever since. Surely that (and the fact that kids were easily running across) meant that it couldn’t actually knock anyone over the side. Besides, the staff there hadn’t asked me to sign an insurance waiver when I bought my park admission ticket, which had to mean it was safe. Right?? So I decided to stop being such a ‘fraidy cat and enjoy the experience and the thrilling scenery below and all around. Still, my first trip across was a little tense — and I still held tightly to the sides. Then I took a deep breath and began the return trip, which didn’t seem as scary. And as my body began adjusting to the shifting movement of the bridge, it was even fun. I immediately got in line to go across again, this time with my camera out to start snapping scenic pics. By then I had fallen in love with the swaying and was having a good time! 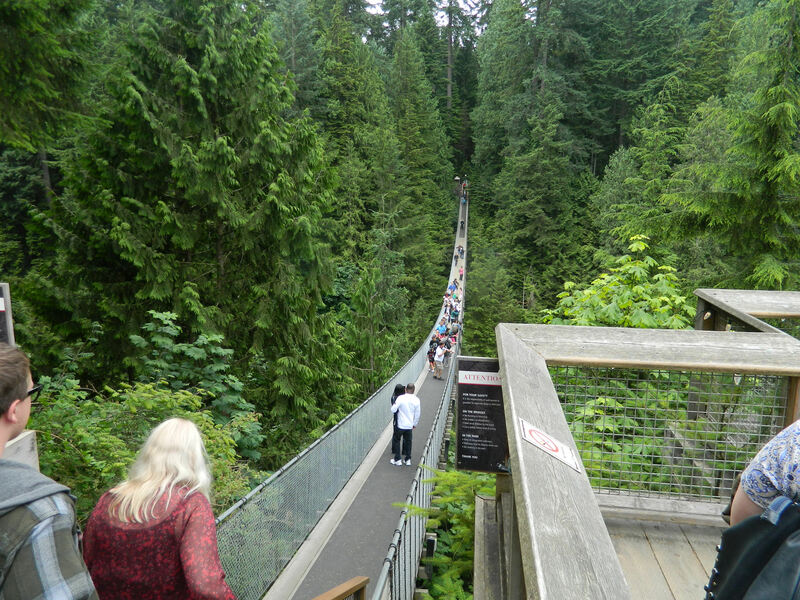 According to the Capilano Suspension Bridge Park website, “millions of visitors” have crossed the bridge since it was first built. And of course the park itself, which covers 27 acres, includes several other fun areas to explore. My favorite featured activity (after the swinging bridge, of course) was the Cliffwalk, which opened in June 2011. 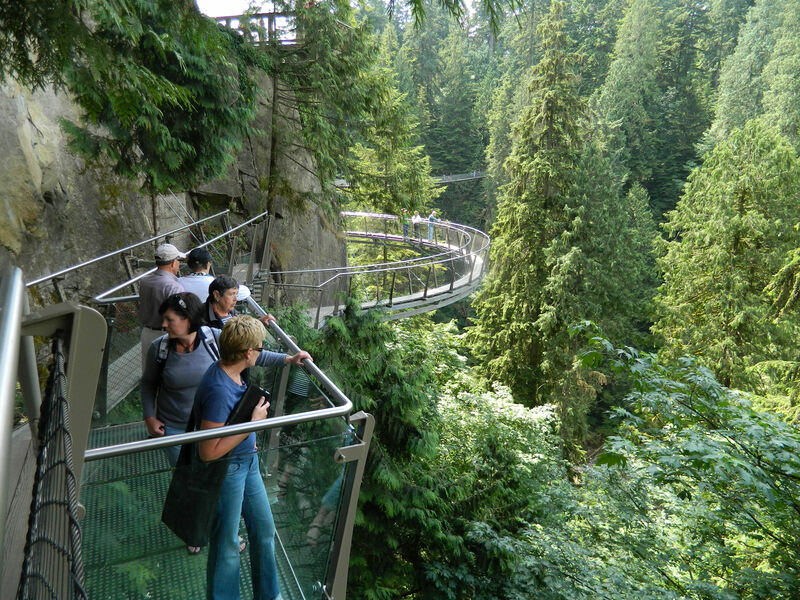 This is a “cantilevered walkway along the granite cliff above Capilano Canyon,” reads the website. To me this narrow, glass-sided walkway, that had a nearly invisible glass-bottom in some places, gave the feeling of walking on air. 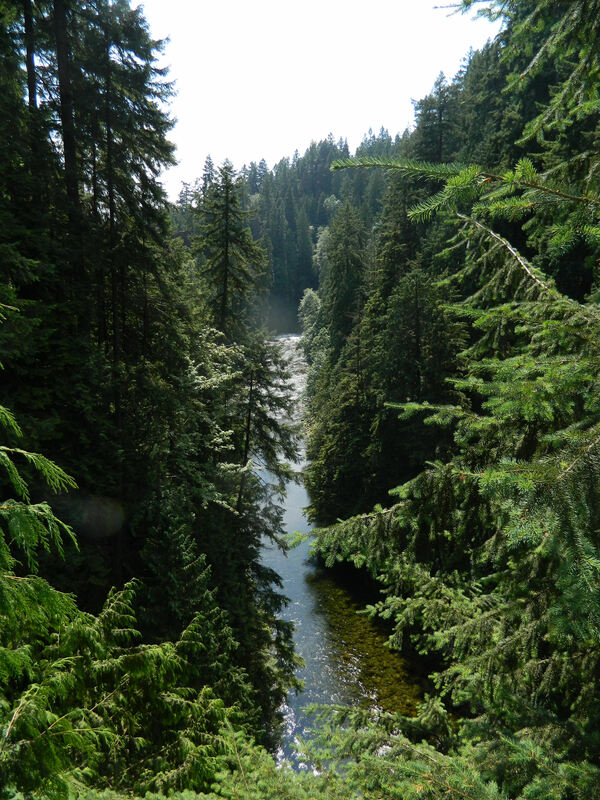 And again, the scenery was absolutely beautiful as we wove our way through bright green forest areas high above the river and around sections where the cliff jutted out. 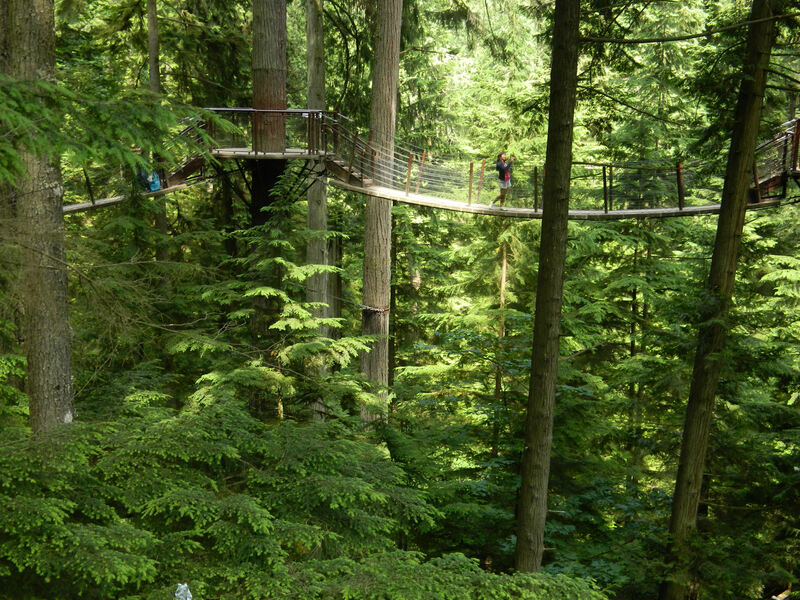 Also fun, and hugely popular with the many kids in the park, was the Treetops Adventure. 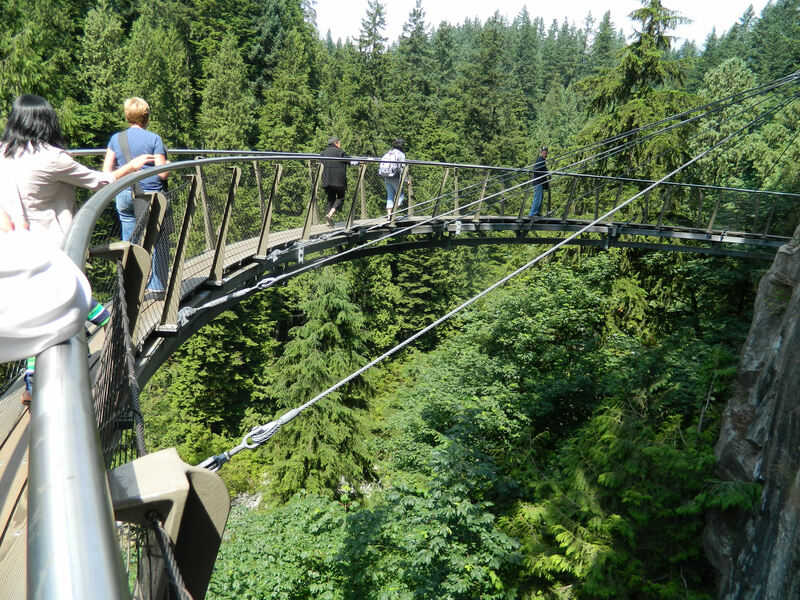 This is a series of 7 interconnecting bridges and viewing platforms suspended up to 100 feet high, letting guests walk among the forest’s evergreens Swiss Family Robinson style. All were great, but I ended up not being able to get enough of that famous “swinging bridge” and went back and forth 5 more times! Oh, and I learned a little secret: the bridge moves more with fewer people on it. In other words, if there’s a huge group crossing, there isn’t as much swing. My last return trip I waited for just the right moment and finally saw a point where nobody was in line. With the bridge all to myself, I started across and soon the swaying was so extreme I became very wobbly. Still, as I walked the last steps on jelly legs, I wore a huge smile. 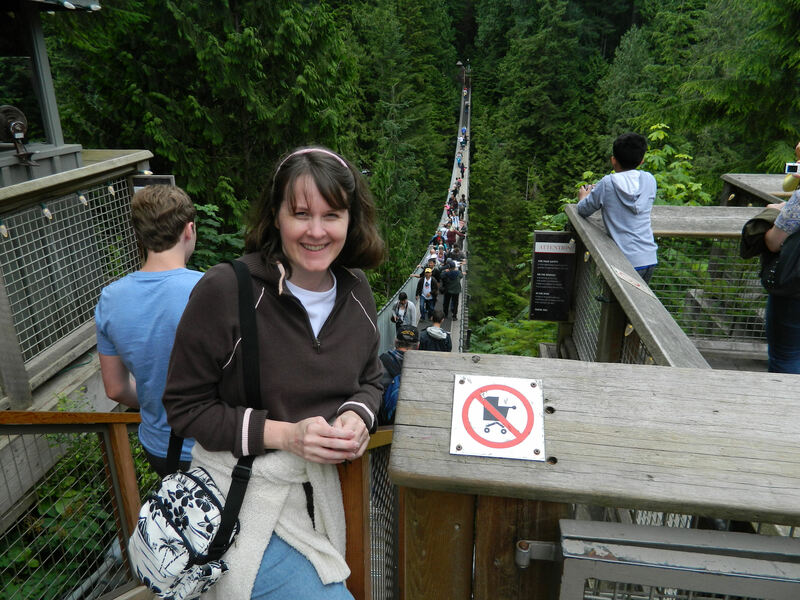 The Capilano Suspension Bridge ended up being just perfect for this thrill seeker! Me and my new best bridge friend! No way Aunty – Nan says she would just topple over and fall off *laughs* She has no head for heights *rolls eyes* Boring. I’d run across it with you though BOL BOL BOL We’d REALLY get it swaying ! Ha! That would be fun Tom. Tell Nan to not feel bad. My dad doesn’t like heights either. He probably would have stood on one end and just not moved at all. I completely get this! It was super fun though, and it helped that I was accompanied by a couple of crazy friends! !